One of the food items I wanted to try on this trip was beef brisket, having heard of the legendary melt-in-your-mouth quality done Hong Kong style. Kau Kee is the one most commonly sited by foodies but we didn't want to bother making a trip to Central, so we settled on Chiu Fat at Tsim Sha Tsui, which was walking distance from our apartment. The food was excellent and the portions generous. The brisket was indeed very tender with a scrumptious herby flavour. The century eggs were exceptional. Lesley-Anne wondered how their t century eggs could taste so much better than the ones in Singapore. "Maybe they're two centuries old!" she offered. I enjoyed the porridge tremendously, especially since it was a cold, cold morning in Hong Kong - 18 degrees celcius! The porridge was thinner than the typical Hong Kong-style congee but very tasty. We were a little startled by our total bill though - it came up to about S$70. I've since come to the realisation that Hong Kong has become very expensive food-wise. On average, prices have gone up 10-20% from when I was here less than two years ago. While in Singapore, I find eating at restaurants pricey, there are at least cheap dining alternatives at hawker centres and food courts. In Hong Kong, a bowl of noodles or a plate of rice at their hole-in-the-wall outlets found in abundance are usually at least HK$40 (about S$7.40). No S$3.50 plates of char siew rice, no sirree. The cheapest dining options are the cha chaan tengs and even then, a drink is about S$3 and a simple pork chop bun about S$4. As an aside, look at what was on offer at Chiu Fat - Saliva Chicken! What on earth? This too was an art installation. Looks like the bookshelf in my nightmares! On a separate note, the latest HK food buzz in Singapore is the Jenny Bakery cookies. They recently opened an outlet in Singapore and I heard you had to queue for them. To be honest, we'd not heard of these cookies until we read the news, so we were a little curious. Are these butter cookies really all that they're made out to be? The HK outlet at Tsim Sha Tsui was just around the corner from our apartment (we really did stay in a convenient location!) Kenneth figured that the cookies would make nice gifts for relatives and since we slept in every day when we were there while he was an early riser, he very kindly offered to queue up for the cookies when they rest of us were still in zzzzzzzzz Land. This was the queue - it went around Mirador Mansions where Jenny Bakery was. After inching your way around the building, just before you enter the building, you're given a ticket and 10 customers are let in to the shop at a time. No ticket, no cookies! Prevents queue-cutting, I guess. There, you give your orders to a no-nonsense counter lady. She's very, very fierce. Kenneth said an elderly lady was queuing in front of him and when she reached the counter after having queued for 50 mins, she was just told very brusquely, "go away, not selling to you." Wah. I think they don't like selling to locals who might be buying the cookies for resale. After 50 mins of queueing, got our cookies! Jenny Bakery is famous for mainly their two types of butter cookies - plain and coffee-flavoured. This is the standard tin which comes in four flavours. So our verdict? To be very honest, we're very puzzled as to how this product earned its cult status. 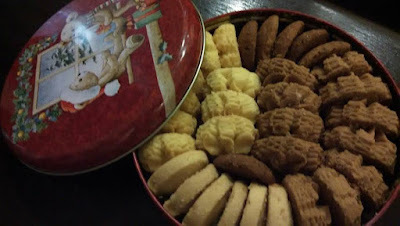 The butter cookies were light and buttery, yes, but they were far from mind-blowing. In fact, the plain butter one was quite bland. I preferred the coffee one as it had more flavour. The other two flavours in the tin - shortbread and oatmeal and raisin - were so ordinary I lack the words to describe them. If you want my opinion, get the cookies only if there's a short queue or you want to bring home gifts for the folks who would probably appreciate the effort you took to get your hands on them! I would dearly love to know the secret behind their success though - how does one maintain such interest in a less-than-stellar product so as to attract perpetual queues? (Kenneth says the queue comprised mostly PRC and Korean tourists). Even hype dies off eventually, right? Well, when I figure out their secret, I'll be off making my first million! Dinner that night was back to Honolulu Cafe because some of us were having food fatigue and we couldn't agree on what we wanted. So we decided to go where the menu ran into endless pages and we could all eat whatever we wanted. Not gonna post pics cos they're similar to what we had on Day 2. Instead, I'm going to post pics of Li Yuen Street East and West - you can pass either of these two narrow uphill streets if you're walking from the Central MTR station to Stanley Street where the restaurants are. Colourful sights and colourful people at every turn, with quaint makeshift shops stuffed full of every kind of knick knacks imaginable. If you want a real bargain and not the touristy knockoffs, I highly recommend coming here instead of to Ladies Market.